Ancient Egyptian history is a long and complex one with more than 3,000 years of details. Throughout these 3,000 years, ancient Egyptians lived under about 30 dynasties, with each dynasty being based on the lineage of the kings/pharaohs. Throughout all these years, the “country” experienced many changes, some being very drastic. The land began as two (Upper & Lower Egypt), with King Menes uniting the two regions at around 3,500 B.C.E. From this point on, the pharaohs were referred to as the rulers of the Two Kingdoms. In art and on tombs, the pharaohs were now depicted with the crowns of Upper and Lower Egypt combined to become one crown, known as the pschent. The reason for the difference in names refers to the flow of the life-giving Nile River. Being that the Nile flows from East Africa’s highlands down to the Mediterranean Sea, Southern Egypt became known as Upper Egypt, and Northern Egypt became known as Lower Egypt. As these two regions developed independently of each other, the differences between them were evident after the unification of the country, though customs from both regions were combined. Ancient Egypt also saw the rise of a complex polytheistic religion, which included many gods and the controversy and conflict of one pharaoh (Akhenaton) even trying to convert the country to monotheism. With his failure, the country reverted back to polytheism during the reign of his son. Relying heavily on the river Nile, the ancient Egyptian civilization expanded and prospered. Trading also allowed the ancient Egyptians to gain much wealth. With this wealth, the royal tombs began to become more elaborate, with the building of pyramids beginning from 2630 B.C.E. 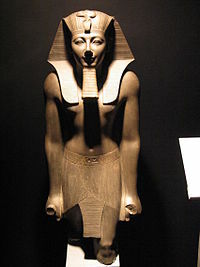 With the rise of the Greek and Roman civilizations, the ancient Egyptians soon came under the rule of foreign leaders. With the rule of the Romans came the introduction of Christianity, leading to the inevitable decline of the ancient Egyptian religion and society.